Once every year or two, the Church of Jesus Christ of Latter-day Saints releases a new manual for in church meetings. These manuals—the Teachings of the Presidents of the Church—cover the teachings of one prophet, seer and revelator who has presided over the Church in the past. The manuals have not been chronological in their order of release. For example, the past three to be released have been Joseph Smith (1st president), George Albert Smith (8th president) and Lorenzo Snow (5th president). As a result, it has become somewhat of a guessing game as to who will be up next. For those who have walked into Distribution Centres in recent times, however, the Teachings of the Presidents of the Church book for 2014 has been revealed: Joseph Fielding Smith. In addition to the new manual, the Church has put up a video gallery with short presentation on the prophets’ lives and teachings. Several of these videos will be linked to this post. Joseph Fielding Smith came from a strong heritage in the Church. His paternal grandfather was Hyrum Smith—the brother of Joseph Smith who also served as patriarch to the Church for a number of years. 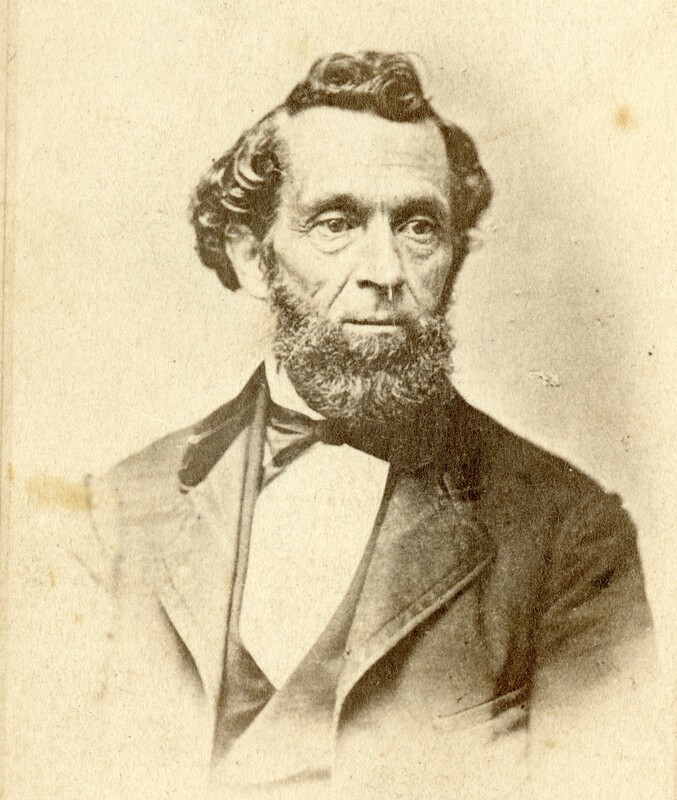 Joseph Fielding’s father was Joseph F. Smith, who served as an apostle and then as president of the Church during an important period of transition. Joseph Fielding’s mother—Juliana Lambson Smith—came from one of the early pioneer families in the Salt Lake Valley and was related to George A. and Bathsheba W. Smith’s niece (Bathsheba was general Relief Society President for a number of years and George A. Smith was her husband and an apostle and counselor to Brigham Young). Juliana had not been able to have any sons prior to Joseph and so, as Joseph Fielding’s son-in-law later explained, “she went before the Lord and, like Hannah of old, ‘vowed a vow.’ Her promise: that if the Lord would give her a son, ‘she would do all in her power to help him be a credit to the Lord and to his father.’ The Lord hearkened to her prayers, and she kept her promises to him” (Smith Teachings 1). Joseph Fielding Smith’s parents in 1916. Joseph Fielding Smith’s life was not an easy one by any means. Since his father practiced polygamy and was a leader in the Church, there were many mouths to feed and much work to do, particularly at times when Joseph F. went away on Church assignments or to hide from federal officials on polygamist hunts. Many responsibilities that would—under normal circumstances—be adult tasks were left to young Joseph Fielding. When he moved out and onwards in life, he would experience many trials, including that of being a widower three times over, none of which were experienced as polygamist marriages. He also would be expected to devote most of his time and talents to the Church in his adult life, resulting in a full-time mission to England shortly after his first marriage began and the many later assignments mentioned above. 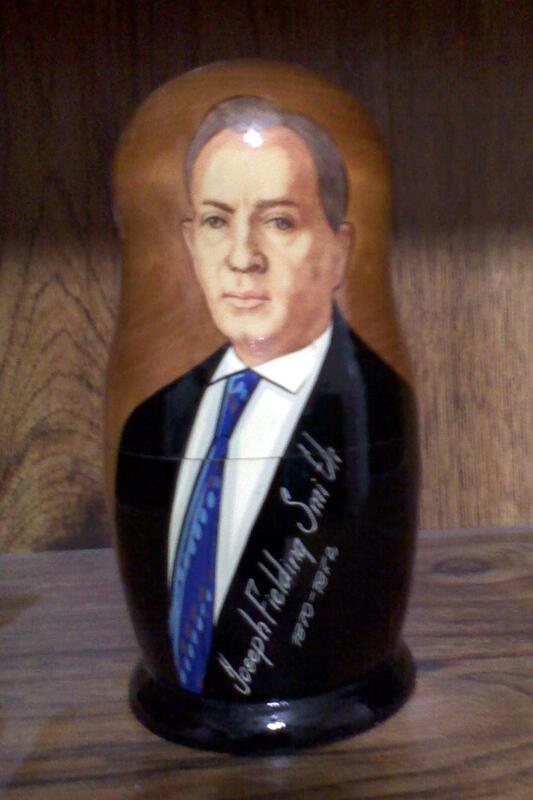 A nesting doll of Joseph Fielding Smith. What sort of a man did this life create? In the public eye he was known as a stern, straightforward and orthodox man, somewhat similar to how Elder Boyd K. Packer is often seen today. There is a story that is attached to both Joseph Fielding Smith and J. Golden Kimball that tells of the man speaking at a stake conference and telling the stake members that if they don’t repent of their neglect in paying tithing, only 10% of them would make it to the Celestial Kingdom. After he received some complaints from offended members, Elder Smith/Kimball returned to tell them that after careful consideration he could acknowledge that he was wrong to make the statement he did and apologized for it… because he realized that only 5% of those members would make it to the Celestial Kingdom. One person who was acquainted with him describe Joseph as being “a quite, retiring introvert, dignified and detached, who always seemed somewhat uncomfortable in a public setting and who never sought to call attention to himself” (Smith Teachings 22-23). Yet, that was only one side of the man. His second wife described him as being “a kind, loving husband and father whose greatest ambition in life is to make his family happy, entirely forgetful of self in his efforts to do this…. The man I know is unselfish, uncomplaining, considerate, thoughtful, sympathetic, doing everything within his power to make life a supreme joy for his loved ones” (Smith Teachings 74). Elder Francis M. Gibbons—a secretary for the First Presidency—recalled that: “His decisions were always made in kindness and love and with the widest latitude of mercy that the circumstances could justify” (Smith Teachings 84). Who is your best friend, or who loves you the most?… The person who tells you all is well in Zion… or the person who warns you of the calamities and the difficulties that are promised unless the principles of the gospel are lived? I want you to know that I love the members of the Church and I do not want of them to point an accusing finger at me when we pass beyond the veil of mortal existence and say, “If you had only warned me I would not be in this predicament.” And so I raise the warning voice in hopes that my brothers and sisters may be prepared for a kingdom of glory (Smith Teachings 83-84). President Smith worked hard to fulfill his duty, whether to call repentance, serve his family, or to fulfill his many callings in the Church. It was perhaps due to this that President Gordon B. Hinckley recalled that President Smith “used three great words that I can never forget.” Those three words were “true and faithful” and they apply to Joseph Fielding Smith as much as he tried to have others live up to those words (see Smith Teachings 1). During his early life, Joseph assisted his father in his assignments, even going to dedicate a meetinghouse in Brigham City in his stead. Joseph Fielding even joked that his first assignment came when he was a baby—when he was nine months old he accompanied his father and Brigham Young to St. George, Utah to attend the temple dedication (see Smith Teachings 117). 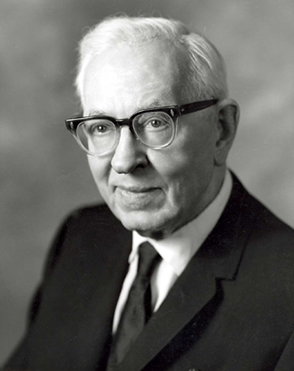 Significant among the callings that Joseph Fielding Smith served in as an adult include his call to be an Assistant Church Historian (1906-1921) and Church Historian (1921-1970); Apostle (1910-1972) and President of the Quorum of the Twelve (1951-1970); Counselor in the Salt Lake Temple Presidency (1919-1935), President of the Salt Lake Temple (1945-1949), and President of the Genealogical Society of Utah (1934-1961); as a counselor in the First Presidency (1965-1970) and finally as President of the Church of Jesus Christ of Latter-day Saints (1970-1972). Now, let us look at each of these assignment groups and Joseph’s feelings about and accomplishments in each of them. There was no one-volume Church history for use by members….. This book, which has gone through many editions, was used extensively for over fifty years in various Church settings….. One may dispute the book’s value as an accurate Church history text, but one cannot discount the influence it had on Mormon historiography and on several generations of Mormons (Bench 55). Of particular interest to Joseph Fielding was defending the name and reputation of his grandfather and great-uncle Hyrum Smith and Joseph Smith, Jr. 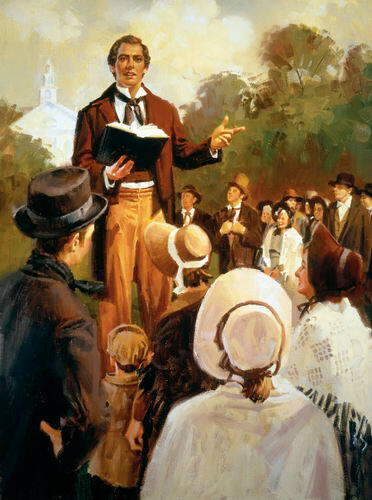 He consistently testified of the Prophet’s life and mission, stating that “I have always been very grateful for the testimony coming to me through the Spirit of the Lord that Joseph Smith, the Prophet of God, was called to stand at the head of the Dispensation of the Fulness of Times” (Smith Teachings 106). Among the works he produced involving his great-uncle was the Teaching of the Prophet Joseph Smith, which served for years in the Church as the standard resource for the Prophet’s words. As an apostle, Joseph Fielding felt it was his responsibility to be a special witness of Jesus Christ. He once said: “I try to love Him, our Redeemer, above all else. It is my duty to. I travel up and down in this country as one of His special witnesses” (Smith Teachings 49). This need to testify of the Savior extended to his family as well. One son recalled. 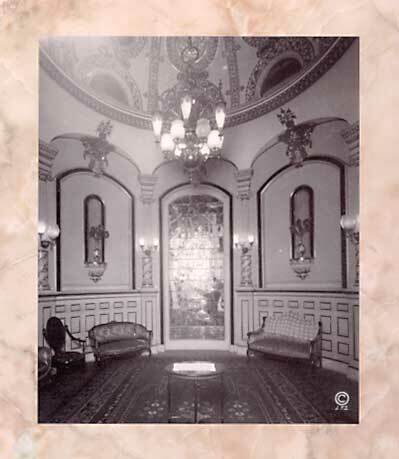 [Once] as I sat alone with my father in his study, I observed that he had been in deep meditation. I hesitated to break the silence, but finally he spoke. “Oh my son, I wish you could have been with me last Thursday as I met with my Brethren in the temple. Oh, if you could have heard them testify of their love for their Lord and Savior, Jesus Christ!” And then he lowered his head and tears streamed from his face and dropped to his shirt. Then, after many seconds, without as much as raising his head, but moving his head back and forth, he said, “Oh, how I love my Lord and Savior Jesus Christ!” (Smith Teachings 50). Joseph Fielding Smith’s other great accomplishment as an apostle was sharing his knowledge of Gospel doctrine. His love for Church doctrine began at a young age. His father handed him a copy of the Book of Mormon when he was eight years old and told him to read it. Joseph “received this Nephite record with thanksgiving and applied [himself] to the task which has been assigned” (Smith Teachings 139). He pushed himself to finish chores quickly or left baseball games early to study the Book of Mormon along with the other scriptures and publications of the Church, secluding himself “in the hayloft or in the shade of a tree to get back to his reading” (Smith Teachings 4). When he worked at ZCMI he carried a pocket-sized edition of the New Testament with him to read on lunch breaks and as he walked to and from his job. As an apostle, President Heber J. Grant was known to have said that Joseph was the “best posted man on the scriptures” among all the General Authorities (Smith Teachings 141). 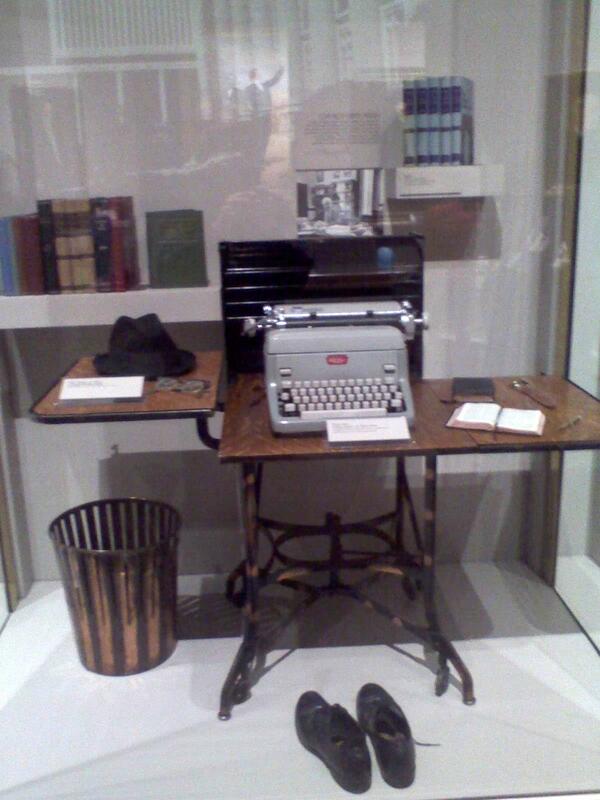 A display of Joseph Fielding Smith’s writing desk and equipment in the Church History Museum in Salt Lake City. President Smith’s love for the gospel and deep understanding of the Church’s doctrine led to the publication of dozens of books and articles and over 125 sermons in general conference, in addition to scores of other addresses in stake conferences and other events on the beliefs and teachings of Mormonism. He was considered a great authority on the matter and was often approached by letter, phone, and in person with questions and concerns. To help answer these questions he began a feature series in the Improvement Era (the Church’s main adult publication at the time) that has since been published in the five-volume Answers to Gospel Questions. Although not every position he held has been accepted as Church doctrine—statements about people of African descent and the priesthood, evolution, and other matters stand among the most glaring examples—he spoke with his understanding of the doctrine as taught by other general authorities of the past and provided a strong, conservative voice in understanding LDS doctrine. President Smith had a deep love and appreciation of genealogical work and work for the dead. At the cornerstone ceremony of the Ogden Temple he stated, “temple building and temple ordinances are at the very heart of our religion…. There is no more glorious work than the perfecting of family units through the ordinances of the house of the Lord” (Smith Address). As a youth, Joseph Fielding watched the work on the Salt Lake City Temple progress—a process that took 40 years all told (construction began 23 years before he was born). 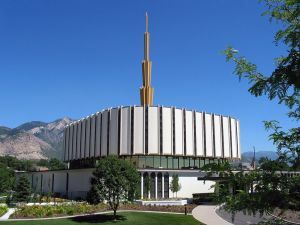 He once said, “I used to wonder whether I would ever live long enough to see the temple completed” (Smith Teachings 5). When he was 17 years old he attended the dedication ceremony and would later serve in various positions in the temple presidency there. As President of the Church he dedicated the Ogden, Utah Temple and presided at the dedication of the Provo, Utah Temple—the first two temples to be dedicated in Utah since statehood had been achieved. As President of the Genealogical Society of Utah—an organization founded in the 1890s to provide support for temple work in the Church—President Smith was a “principle force behind the society” and helped its growth and efficiency by studying the libraries and programs of the eastern United States and introducing improved methods of filing and record keeping to the Utah society during a time of great expansion in genealogical and temple work (see Alexander 313-315; Allen and Leonard 483). In connection with his belief in eternal families and the “perfecting of family units” President Smith also placed great emphasis on strengthening the family. His teachings reflect a desire to strengthen eternal marriage and to bring up children in light and truth. One of the methods he focused on was family home evening, stating that “Fathers and mothers who faithfully hold family home evenings and who build family unity in every way possible, fulfill with honor the greatest of all responsibilities–that of parenthood (Smith Teachings 211). Joseph Fielding Smith addressing a congregation. 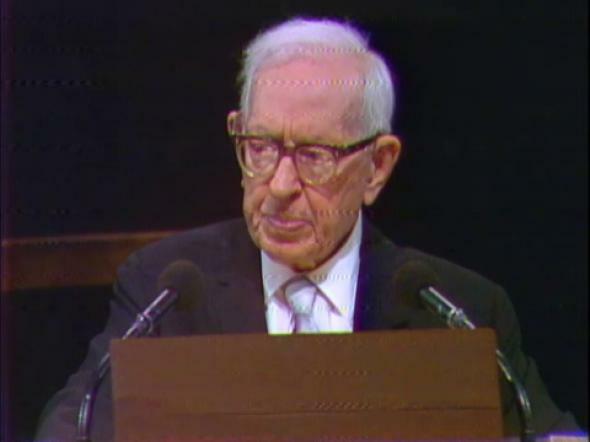 After the death of David O. McKay in January 1970, Joseph Fielding Smith became president of the Church. Although he was ninety-three years old when he rose to the helm of the Church, President Smith “proved that he was still vigorous both mentally and physically…. He kept up at a remarkable pace, including an active speaking schedule, and many who had been critical of a system that allowed aged men to govern had ample reason to change their minds” (Allen and Leonard 594). His ministry was only two and one-half years—and much of what President Smith did was an outgrowth of David O. McKay’s administration—yet, there were several important changes in the Church that took place during that time: the education program, the Historical Department, and the publications program were all reorganized; the Social Services Corporation was organized and a training program for bishops was initiated; and the teacher development program of the Church was expanded. In addition, the Church was becoming an increasingly international organization and President Smith helped to deal with this growth, organizing fourteen new missions and several new stakes as well—including the first stakes in Asia (Tokyo, Japan) and Africa (Johannesburg, South Africa). It was also under Joseph Fielding’s administration that the first area conference was held in Manchester England, strengthening the Church abroad (see Allen and Leonard 594-596). President Joseph Fielding Smith’s ministry was short, but oversaw an important period of transition and correlation. His love of the Lord and absolute, unswerving fidelity with which he sought to signify that love by keeping his commandments and doing ever those things which would please the Lord. His loyalty to the Prophet Joseph Smith and the everlasting truths restored through him; to his grandfather, the Patriarch Hyrum Smith,… [who] met a martyr’s death; and to his father, President Joseph F. Smith, whose name is enshrined forever in the celestial city as one who endured valiantly in the cause of him whose blood was shed that we might live. His own gospel scholarship and spiritual insight; his own unwearying diligence as a preacher of righteousness; and his own course of feeding the hungry, clothing the naked, visiting the widow and the fatherless, and manifesting pure religion by precept as well as by example (Smith Teachings 26-27). Joseph Fielding Smith, a man stern in devotion to his creed, yet tender in regard for essential needs of people everywhere, gave wise counsel to his associates, loving care to his family and exalted leadership to his church responsibilities. He will be missed, but remembered with special esteem (Smith Teachings 32). Alexander, Thomas G. Mormonism in Transition, 3rd ed. Salt Lake City, UT: Greg Kofford Books, 2012. Allen, James B. & Glen M. Leonard. The Story of the Latter-day Saints, 2nd ed. Salt Lake City, Deseret Book Company, 1992. Bench, Curt. “Reviews: Fifty Important Mormon Books.” Sunstone Magazine October 1990, 54-58. Smith, Joseph Fielding. “Address, September 7, 1870, Cornerstone Laying of Ogden Temple.” 7 September 1870. TS. LDS Church History Library, Salt Lake City, Utah. Smith, Joseph Fielding. 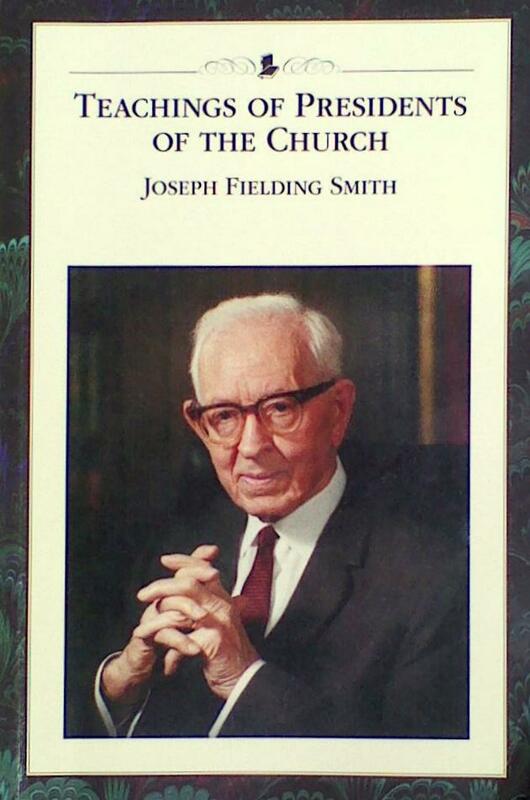 Teachings of the Presidents of the Church: Joseph Fielding Smith. Salt Lake City, UT: Church of Jesus Christ of Latter-day Saints, 2013. The Church’s official stance on evolution is that “Upon the fundamental doctrines of the Church we are all agreed. Our mission is to bear the message of the restored gospel to the world. Leave geology, biology, archaeology, and anthropology, no one of which has to do with the salvation of the soul of mankind, to scientific research, while we magnify our calling in the realm of the Church…. “Upon one thing we should all be able to agree, namely, that Presidents Joseph F. Smith, John R. Winder, and Anthon H. Lund were right when they said: ‘Adam is the primal parent of our race’” [First Presidency Minutes, April 7, 1931]. 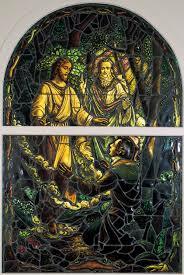 The event known as the First Vision gradually took its place as the founding story of Mormonism. 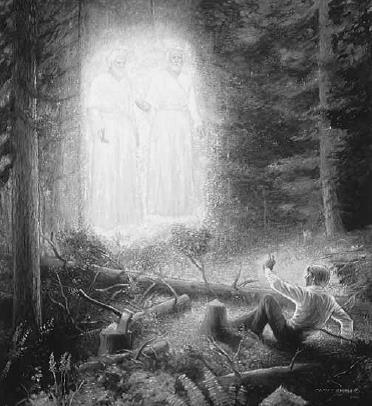 As it rose to prominence, contemporary saints recorded recollections of times that the Prophet shared his sacred experience in the grove with them, resulting in several later reminiscences. These are found in transcripts of sermons, missionary tracts, and memoirs of these faithful pioneer saints. Since these accounts have a barrier of time—increasing the chances of faulty memory—they are not as reliable as contemporary secondary or primary accounts of the vision, but are of interest nonetheless. The church of Jesus Christ of Latter-day Saints was first organized in the Town of Manchester, Ontario County, State of New York, U.S.A., 6th April 1830. Previous to this an holy angel appeared unto a young man about fifteen years of age, a farmer’s son, named Joseph Smith, and communicated unto him many things pertaining to the situation of the religious world, the necessity of a correct church organization, and unfolded many events that should transpire in the last days, as spoken of by the Prophets. As near as possible I will give the words as he related them to me. He said that “in the neighborhood in which he resided there was a religious revival, (a thing very common in that country) in which several different denominations were united; that many professed to be converted; among the number, two or three of his father’s family. When the revival was over, there was a contention as to which of these various societies the person who was converted should belong. One of his father’s family joined one society, and another a different one. His mind was troubled, he saw contention instead of peace, and division instead of union; and when he reflected upon the multifarious creeds and professions there were in existence, he thought it impossible for all to be right, and if God taught one, He did not teach the others, “for God is not the author of confusion.” In reading his bible, he was remarkably struck with the passage in James, 1st chapter, 5th verse. “If any of you lack wisdom, let him ask of God, that giveth to all men liberally and upbraideth not, and it shall be given him.” Believing in the word of God, he retired into a grove, and called upon the Lord to give him wisdom in relation to this matter. While he was thus engaged, he was surrounded by a brilliant light, and two glorious personages presented themselves before him, who exactly resembled each other in features, and who gave him information upon the subjects which had previously agitated his mind. He was given to understand that the churches were all of them in error in regard to many things; and he was commanded not to go after them; and he received a promise that the fulness of the gospel should at some future time be unfolded unto him; after which the vision withdrew leaving his mind in a state of calmness and peace (Taylor 255-256). John Taylor. Image courtesy LDS.org. We see in John Taylor’s account influences of both the Pratt-Hyde-Smith publications and the “official” 1838 account. Elder Taylor would go on to be, perhaps, the man who spoke of the vision second most often, after Orson Pratt and there are many sermons recorded in the Journal of Discourses and other sources in which this man of God spoke of the First Vision. Joseph Smith, junior, whom it pleased the Lord to select and appoint to restore the primitive Gospel and apostolic Priesthood, was born in 1805 in Vermont, United States. 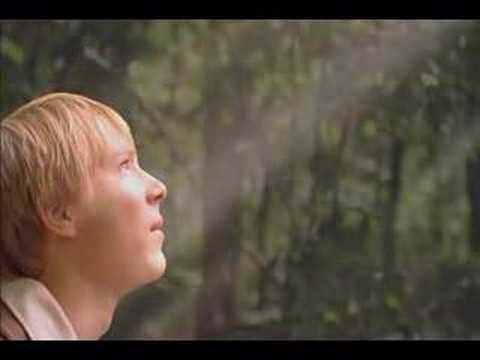 When about 15 years of age, being seriously impressed with the necessity of seeking the Lord and preparing for a future state, his mind became much perplexed through difficulties thrown in the path of his researches by the multitude of religious sects and parties with which he was surrounded. Each system claimed its right and power to give belief and hope, but none to communicate knowledge of its divine Authority. In comparing them one with another there seemed too much confusion, the same also appeared in looking at each separately:–turning therefore from these clashing systems, and having been encouraged, and inspired with the following passage in St. James “If any of you lack wisdom let him ask of God;” he retired to a grove, a little distance from his father’s, and in fervent prayer besought the Lord to communicate with him, and reveal the way of salvation. While thus engaged a light brilliant and glorious appeared in the heavens gradually descending towards him till he was enveloped in its power, and wrapped in celestial vision; when he beheld two glorious beings similar in dress and appearance who informed him that the religious sects had all departed from the ancient doctrine of the apostles, and that the Gospel, with its gifts and blessings should be made known to him at a future period. Many important things were manifested in this vision which the brevity of this work will not admit our noticing (Snow 1). 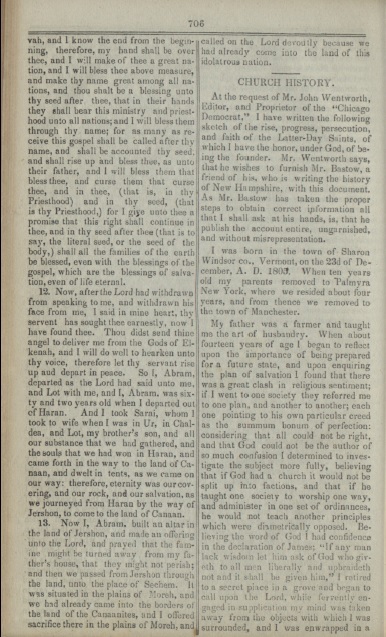 Much like the John Taylor tract, this publication depends much on the previously-published accounts of the Wentworth Letter, the Pratt and Hyde pamphlets and the 1838 account. Nevertheless, Elder Snow has left us a polished and pleasant account of the First Vision. 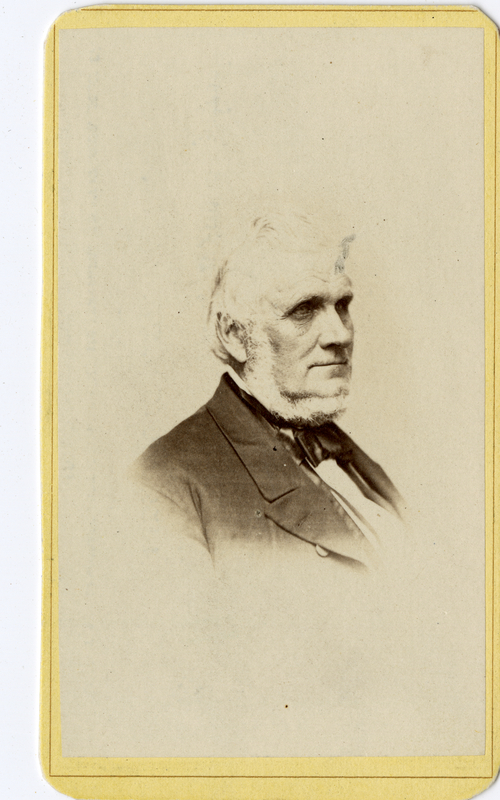 Lorenzo Snow. Image courtesy LDS.org. What is the testimony of the Latter−day Saints in regard to the calling of any one in this church? We want now to test ourselves. Are we the kingdom of God that was to be established in the last days? or are we not? Have we the characteristics of that kingdom? Have we been called in that way and manner that the servants of God in ancient days were called? To answer this question, let us go back to Joseph Smith − the one that organized this church by the commandment of the Almighty…. I will give you a brief history as it came from his own mouth. I have often heard him relate it. He was wrought upon by the Spirit of God, and felt the necessity of repenting of his sins and serving God. He retired from his father’s house a little way, and bowed himself down in the wilderness, and called upon the name of the Lord. He was inexperienced, and in great anxiety and trouble of mind in regard to what church he should join. He had been solicited by many churches to join with them, and he was in great anxiety to know which was right. 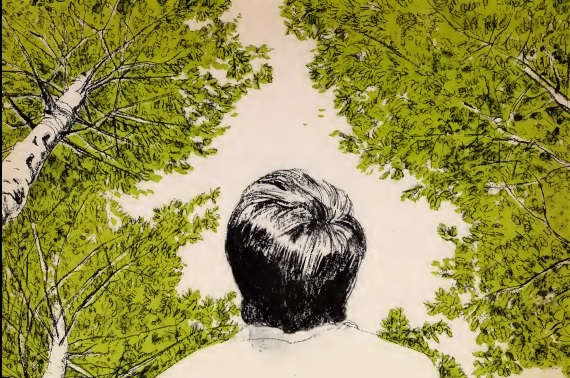 He pleaded with the Lord to give him wisdom on the subject; and while he was thus praying, he beheld a vision, and saw a light approaching him from the heavens; and as it came down and rested on the tops of the trees, it became more glorious; and as it surrounded him, his mind was immediately caught away from beholding surrounding objects. 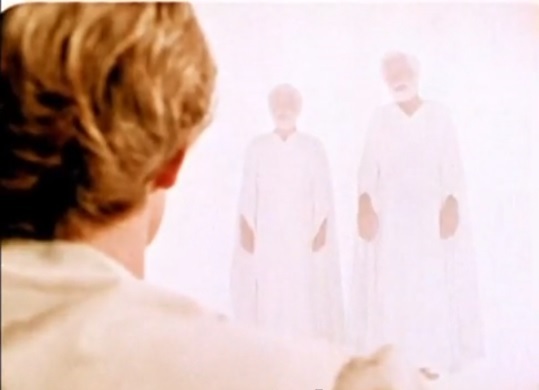 In this cloud of light he saw two glorious personages; and one, pointing to the other, said, “Behold my beloved son! hear ye him.” Then he was instructed and informed in regard to many things pertaining to his own welfare, and commanded not to unite himself to any of those churches. He was also informed that at some future time the fulness of the Gospel should be made manifest to him, and he should be an instrument in the hands of God of laying the foundation of the kingdom of God (JD 7:220-221). 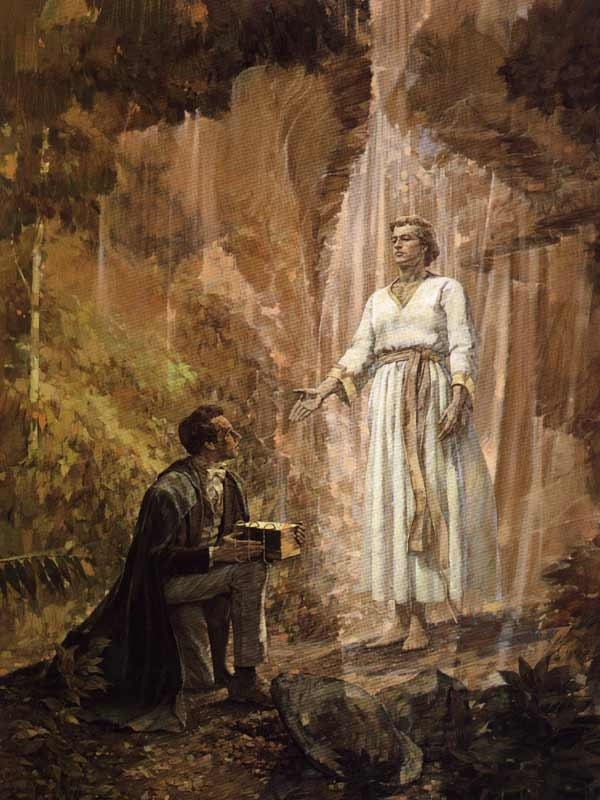 Joseph Smith, …was a boy about fourteen years of age at the time the Lord first revealed himself in a very marvelous manner to him. The circumstances were these: This boy, in attending religious meetings that were held in his neighborhood, seemed to be wrought upon in a very wonderful manner, and he felt great concern in relation to the salvation of his soul… but how to satisfy himself he did not know. If he went to one denomination they would say, “We are right, and the others are wrong,” and so said all the others. 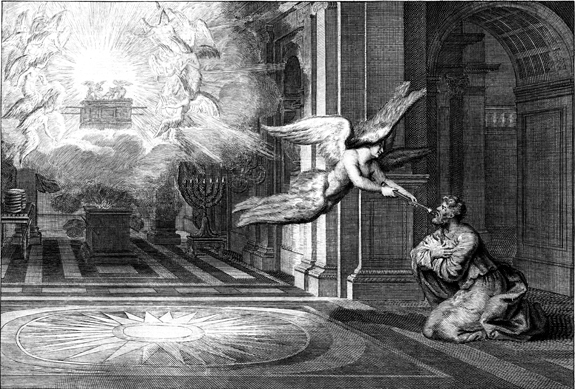 Like most boys of his age, Joseph had never read the Bible to any great extent, hence he was unable to decide in his own mind, as to which was the true church. When he saw several denominations contending one with the other, he naturally enough supposed that some of them must be wrong. He began to search the Bible in his leisure time after his work was done upon the farm; and in perusing the New Testament, he came across a passage which is very familiar indeed to most of my hearers; the passage reads thus − If any of you lack wisdom let him ask of God, who giveth to all men liberally and upbraideth not; and it shall be given him.” Mr. Smith really believed this passage. He did not read this as one would read a novel, thinking that is was all imaginary; but, from his heart, he believed that it meant what it said, and he said to himself − “I certainly lack wisdom in relation to my duty. I do not know which of these denominations is correct, and which is the church of Christ. 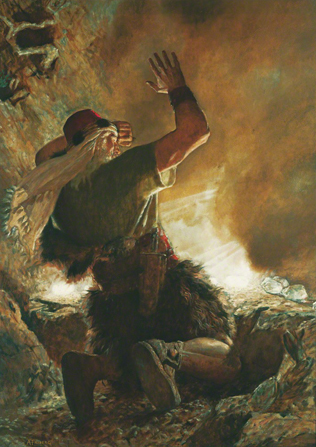 I desire to know, with all my heart, and I will go before the Lord, and call upon his name, claiming his promise.” He therefore retired a short distance from his father’s house, into a little grove of timber, and called upon the Lord, claiming this promise, desiring to know his duty and to be informed where the true Church of Christ was. While thus praying, with all his heart, he discovered in the heavens above him, a very bright and glorious light, which gradually descended towards the earth, and when it reached the tops of the trees which overshadowed him, the brightness was so great that he expected to see the leaves of the tree consumed by it; but when he saw that they were not consumed he received courage. Finally the light rested down upon and overwhelmed him in the midst of it, and his mind at the same time seemed to be caught away from surrounding objects, and he saw nothing excepting the light and two glorious personages standing before him in the midst of this light. One of these personages, pointing to the other, said—’Behold my beloved Son, hear ye him.. After this, power was given to Mr. Smith to speak, and in answer to an inquiry by the Lord as to what he desired, he said that he desired to know which was the true Church that he might be united thereunto. He was immediately told, that there was no true Church of Christ on the earth, that all had gone astray, and had framed doctrines, and dogmas, and creeds by human wisdom, and that the authority to administer in the holy ordinances of the Gospel was not among men upon the earth, and he was strictly commanded to go not after any of them, but to keep aloof from the whole of them. He was also informed that, in due time, if he would be faithful in serving the Lord, according to the best of his knowledge and ability, God would reveal to him still further, and make known to him the true Gospel, the plan of salvation, in its fulness. Mr. Smith had this vision before he was fifteen years old, and, immediately after receiving it, he began to relate it to some of his nearest friends, and he was told by some of the ministers who came to him to enquire about it, that there was no such thing as the visitation of heavenly messengers, that God gave no new revelation, and that no visions could be given to the children of men in this age. This was like telling him that there was no such thing as seeing, or feeling, or hearing, or tasting, or smelling. Why? Because he knew positively to the contrary; he knew that he had seen this light, that he had beheld these two personages, and that he had heard the voice of one of them;…and he continued to testify that God had made himself manifest to him (JD 17:279-280, Sept. 20, 1874). 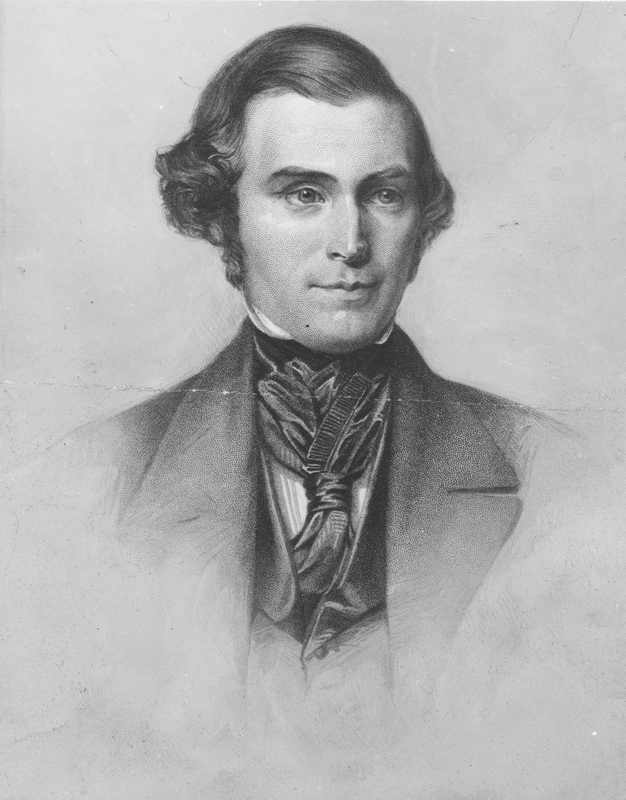 Orson Pratt. Image courtesy LDS.org. We see here specific details not mentioned before, but that seem to be logical inferences from the texts Joseph left behind, such as telling “some of his nearest friends” in addition to multiple ministers telling him the vision was false and that he had not read the Bible very much before the religious excitement his town experienced. One could easily assume that these were memories that Pratt had from hearing Joseph talk about the vision, but as we have no other record that records the details in that manner, it is hard to tell. 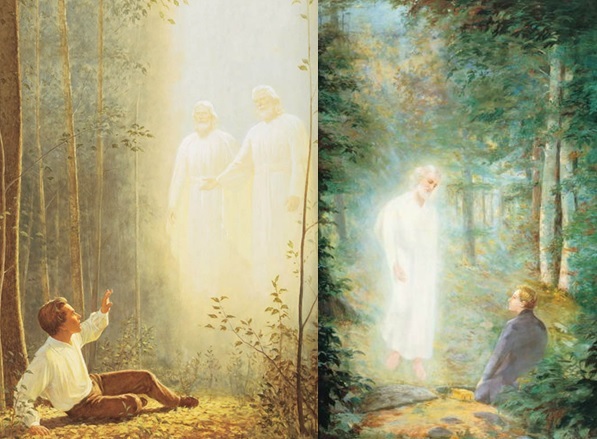 With uplifted hand he [Joseph Smith] said, “I am a witness that there is a God, for I saw Him in open day, while praying in a silent grove, in the spring of 1820.” He further testified that God, the Eternal Father, pointing to a separate personage, in the likeness of Himself, said, “This is my Beloved Son; hear ye Him.” O how these words thrilled my entire system and filled me with joy unspeakable—to behold one who, like Paul the Apostle of olden time, could with boldness testify that he had been in the presence of Jesus Christ! (cited in Cheesman 27-28). 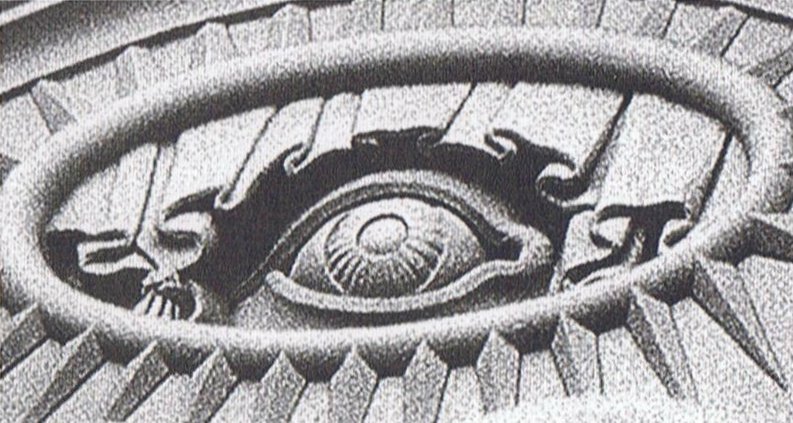 Jerry Thompson’s illustration of the First Vision. Image from Improvement Era 1970. 2nd February, Thursday, 1893, attended Fast meeting…. Br. John Alger said while speaking of the Prophet Joseph, that when he, John, was a small boy he heard the Prophet Joseph relate his vision of seeing the Father and the Son, that God touched his eyes with his finger and said, “Joseph this is my beloved Son, hear him.” As soon as the Lord had touched his eyes with his finger he immediately saw the Savior. After [the] meeting a few of us questioned him about the mater and he told us at the bottom of the meeting house steps that he was in the House of Father Smith in Kirtland when Joseph made this declaration; and that Joseph while speaking of it put his finger to his right eye, suiting to the action with the words so as the illustrate and at the same time impress the occurrence on the minds of those unto whom he was speaking (Cited in Cheesman 30). Here we see a detail found nowhere else that I know of—of God touching Joseph’s eyes to reveal the Savior. 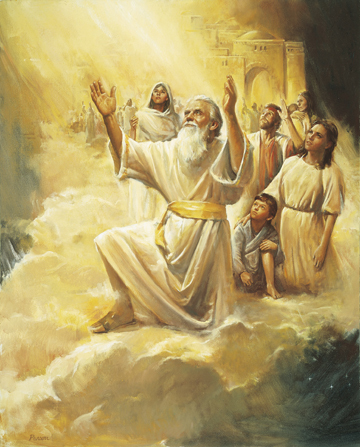 Since this is a tertiary account—a record written by someone recalling what someone else said or did—that was produced fifty years after Joseph died (and over seventy years after the First Vision took place), it is liable to be faulty, however it is an interesting idea. Repent from your heart, reform of [your] sins, be baptized in name of Jesus Christ—and [the] promise is you shall receive the gift of Holy Ghost. What is [its] effects? [The] effects upon you [are] as it was in [the] day of Pentecost, inasmuch as you have the same experience. After you have walked in obedience to commandments of God, then the promise is you shall see visions, dream dreams, [and] have revelations of Jesus Christ—[of] which thousands in this congregation [can] rise up and testify. For he saw the living God (Hymns 26). For Wisdom and for light. The published edition was set to music by A.C. Smyth—a professional Mormon musician—using an expanded version of American composer Sylvanus Billings Pond’s tune, Divinity, and was published in the 1889 Latter-day Saints’ Psalmody (see Davidson 54-55), and continues to serve in our hymnbooks today as one of our more popular hymns of the Restoration. 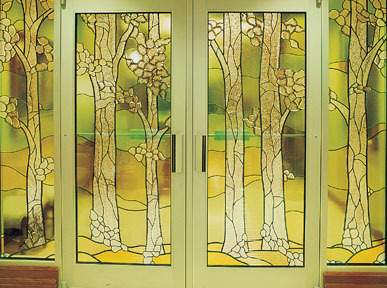 Stained glass doors to the Palmyra Temple depicting the Sacred Grove. The First Vision has taken on great importance for the Mormon people and the Church of Jesus Christ of Latter-day Saints as whole. It is considered by many to be the greatest event to take place since the Atonement and Resurrection of Jesus Christ as it was the curtain-raising event that initiated the Restoration of the Church and Gospel of Jesus Christ in modern times. 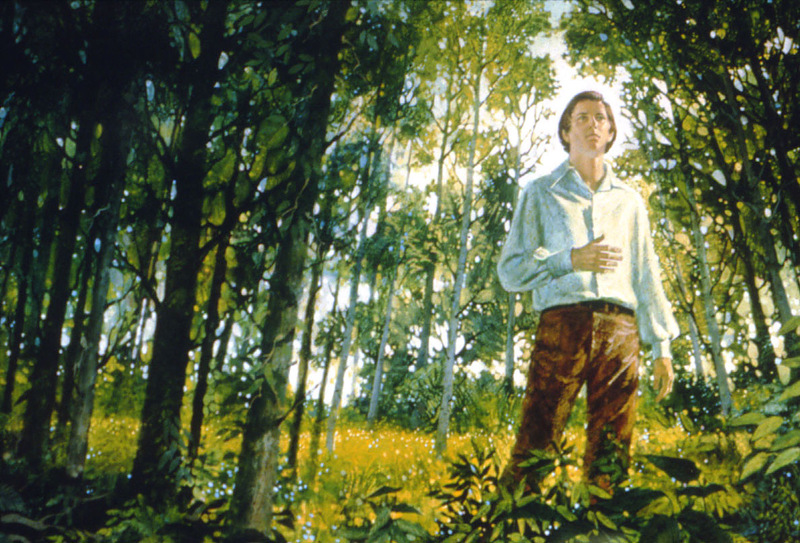 Many accounts were produced by Joseph Smith as well as people who came in contact with him. Of the latter category, many accounts were produced after Joseph Smith’s lifetime. While these accounts must be approached cautiously, they are rather interesting to read to gain insights into this important theophany. Between these records and the many other accounts that have been given, we can gain a fuller picture of the pivotal event that launched the career of the Prophet of the Restoration, Joseph Smith, Junior and how it has shaped the Church of Jesus Christ of Latter-day Saints. The Holy of Holies in the Salt Lake City Temple, with its stained glass window of the First Vision. Andrus, Milo. Sermon, July 17, 1853, transcribed by LaJean Purcell Carruth. TS. Church History Library, Salt Lake City, UT. Davidson, Karen Lynn. Our Latter-day Hymns: The Stories and Messages. Salt Lake City: Deseret Book, 1988. Journal of Discourses. Ed. George D. Watt, et al. 26 vol. Liverpool: F. D. Richards, et al., 1854-1886. Print. Snow, Lorenzo. The Voice of Joseph. Malta, 1852. Taylor, John. “Letter to the Editor of the Interpreter Anglais et Français, Boulogne-sur-mer (25 June 1850).” Reprinted in John Taylor, Millennial Star 12 no. 15 (1 August 1850), 235–236.